This morning the Cetacea travelled out to the shipping lane where we had sightings yesterday. It was a bit bumpy out there this morning with 2-4 foot swells and it was also pretty windy which made it difficult for us to spot anything. 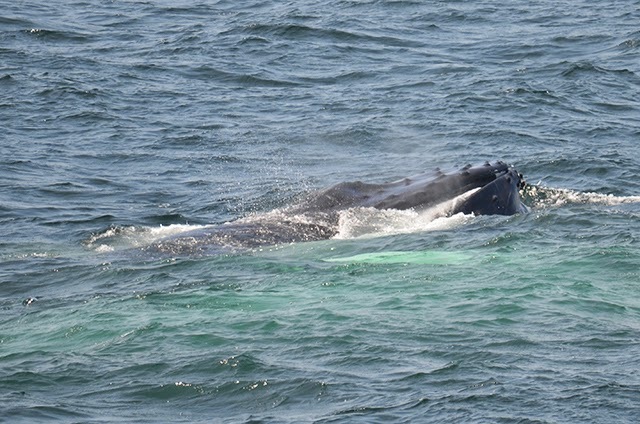 Eventually, we found a finback whale and got a few looks at both sides of the whale. This individual finwhale showed us the top of its rostrum during a few surfacings as it took breaths at the surface. We decided to continue looking for other whales, so we headed south. 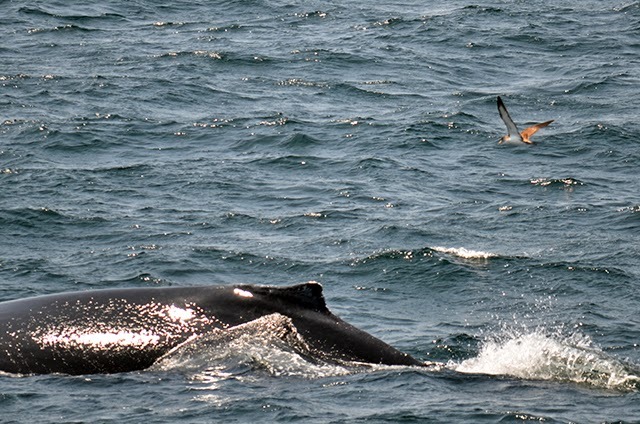 Before heading back to Boston we found a rather large minke whale with a visible blow. 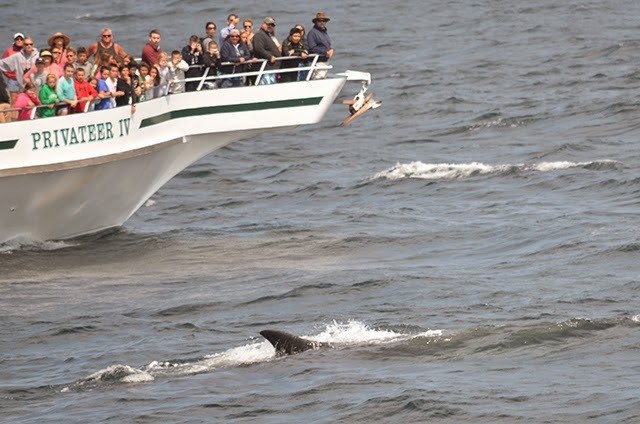 This afternoon, we headed straight to the southwest corner where other whale watch boats had reported successful sightings. 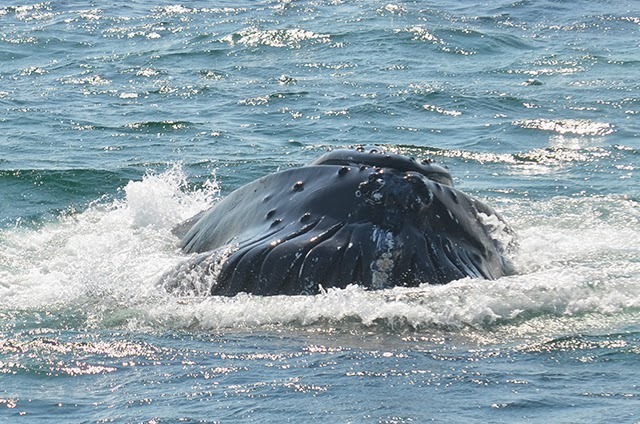 Once we arrived, we happened upon Hancock, a female humpback born in 1991. Hancock fed using her usual bubble ring method. She even made a beautiful bubble ring right alongside our starboard pulpit! 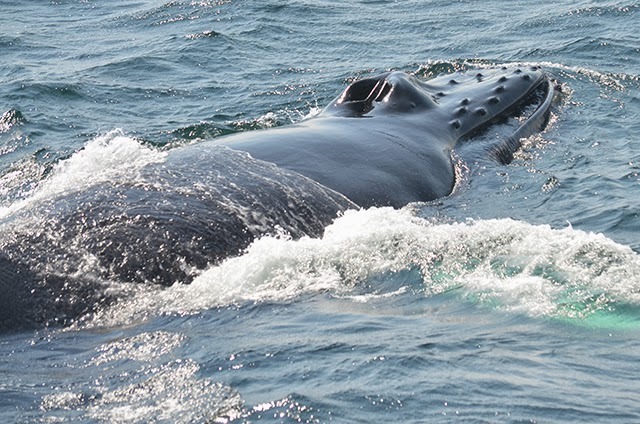 Our passengers were repeatedly treated to Hancock’s refreshingly misty whale breath! Hancock repeatedly came up to the surface with her. Luckily the seas settled down a bit! Here’s to hoping this upcoming storm passes over quickly! It might feel like 90 degrees on land but it’s absolutely beautiful out on Stellwagen Bank. On the 10am trip on the Asteria we headed out to an area south west of the southwest corner. This area is near the entrance to Cape Cod Bay and not a usual place to find whales, but oh were there whales. We spotted two fin whales, two humpbacks and maybe even a minke whale. We spent a lot of time with Hancock, our old friend who has been around a lot this season. Hancock seemed to be doing some random dives when we first arrived but then started feeding using big bubble rings so maybe those random dives weren’t so random after all. Hancock was probably hunting for fish along the seabed! While we watched Hancock, the other humpback who we never got a look at was also active behind us and even made a big splash from either a breach or tail breach. I didn’t see it but I hope some of the passengers got a look. There were also some shearwaters in the area and I got a great shot of one flying over Hancock. It was a great way to spend such a hot day. 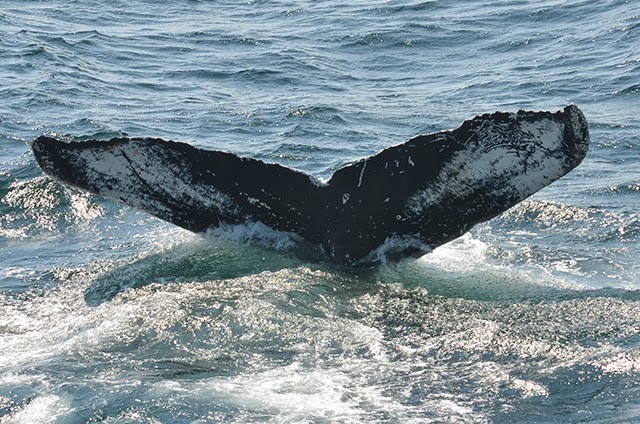 Today on board the Aurora, we traveled to Cape Cod Bay in search of whales. We heard reports of whale activity off Race Point. Once there we began our search in windy conditions. We first found a fast traveling finback whale. We didn’t stay with this individual long because it was moving quickly. Next, we went in search of some humpbacks. We spotted a blow about 3 miles away. Once there we found Hancock. She was taking 2-4 minute dives. Passengers always love short dive times because then they get to spend more of the trip viewing these amazing creatures. We got to observe Hancock doing some bubble cloud feeding. She even approached the boat a couple of times. We also spotted another blow in the distance but didn’t have time to check it out. When we left Hancock we traveled in the direction of the other blow and found that it was Measles. It was great for passengers to be able to compare the two species that we observed today.